When you’re in the market for a new piano, looking at all the different piano brands out on the marketplace can make it difficult at best. Like other products, if you purchase a high quality piano brand, you’ll know it’s made with care, meeting the high standards the brand name is known for. There are many manufacturers that have been around for decades, and still believe in doing things the old fashioned way. Many pianos were made lovingly by hand, with individual care put into every step of the process. For example, we sell high quality Bosendorfer used pianos. Bosendorfer continues to rank high on the quality scale, being one of the oldest and most prestigious manufacturers of acoustic pianos. They are known for their intricate hand-craftsmanship, and their inspiring, rich tonal quality. They don’t just produce a piano, they create a work of art. And they’ve been doing so since the early 1800s. We also carry Steinway & Sons. Steinway & Sons have been manufacturing pianos since the mid 1800s. They are well known in the piano industry for creating some of the best pianos to own. 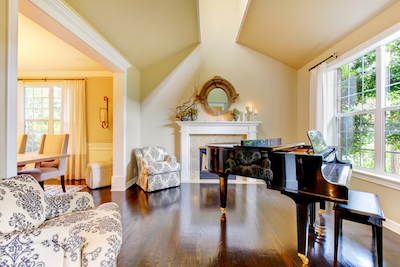 When you walk into a home with a Steinway sitting in the middle, it instantly says quality. Steinway’s are also top of preferred pianos from the biggest musicians in the world. Because they are at the top of the preferred list, the pricing of a Steinway can scare some people away. They aren’t for the hobbyist, and instead, are preferred by people wanting high quality and to invest in a piano that will last a lifetime. Of course, there are many high quality manufacturers that are perfect for entry level too. Baldwin is one of the largest piano manufacturers in the US, having been founded in the mid 1800s in Cincinnati. While they are considered more affordable than Steinway’s, they are also known for their reliability and tonal quality. They have detailed craftsmanship and will increase in value if they are well cared for. Or how about Yamaha? This is probably one of the most recognized brands. They also top the affordability list. These precision-made pianos are crafted in Japan, and are some of the most widely used pianos in practice rooms and home studios. If you take up the piano and play in different places, chances are you will sit down at a Yamaha at some point in your career. These aren’t the only high-quality brands you should consider when you’re ready making a purchase. There are many piano brands that would be a perfect addition to your home. Have a question? The best way to see the difference is to stop by and take a look. We’d be happy to let you play several different brands and hear which would be the perfect choice for your home.